I happened to buy a couple of the corkscrew trocars this year, just in case. Never used them before, but I thought well you never know. Had a replacement heifer 5 days ago bloated up and getting in a bad way. Put her in and installed the device and let the air out of her. Starting to think I should take it out, vet claims that they often fall out after a week or two. Anyone ever used these things? Considered getting an ionophore added to my feed, but it's never been a problem before, seems like this is just a one off, was only feeding about 4-5 lbs a day but have backed off a touch just in case. I don’t see how a corkscrew trocar could fall out. I thought that was the whole point of the corkscrew. But then again, my advice may be worth exactly what it cost you. FWIW, I don’t think 4-5 lbs a day would be enough to cause a problem. But I guess it would depend on 4-5 lbs of what? I think I bought one for 'just in case' a few years ago. I really shouldn't have them at all. Any time I get a bloater, they become a chronic bloater and just a pain in the be nice to keep alive. One that really p!ssed me off was a calf a number of years ago that bloated in September, never did it again until January 20th the following year - stone dead. Now if they start bloating, if I get them turned around, they go down the road ASAP. I agree with Aaron. Unless you were pushing them on feed, if you just have one, it may just be the individual and may be a chronic problem. Jeanne - Simme Valley wrote: I agree with Aaron. Unless you were pushing them on feed, if you just have one, it may just be the individual and may be a chronic problem. LOL. I just remember reading as a kid that susceptibility to bloating was a genetic fault in cattle and that it should be culled for to control it. Most animals will never bloat and some will bloat with the most minute diet/environmental change. Wish I could remember where I read it. There’s lots of good reading on bloat, but the problem is there are a hundred reasons it can happen. Chronic bloaters won’t get better for sure, and I doubt this calf is chronic. Could be inflammation in the lymph nodes or perhaps she had had a touch of pneumonia, lots of things. We’ll see what happens but she’s doing much better than if I’d done nothing. Edited to add: chronic bloaters don’t tend to go straight to acute from nothing in no time flat. They tend be just chronically bloated somewhat but not necessarily acutely. If that makes sense. A few of my cows and one bull bloated last week. I went from feeding bahia grass hay to millet hay with to much coffee weed in it, I presume. I went back to the bahia and the bloat went away. I'm going to feed 2 rolls of bahia and 2 rolls of millet hay a day and see what happens next week. I thought I lost the bull but he got up went to eating the bahia. Everyday is something new when it comes to cattle. Once you put one in leave it for 3 or 4 weeks. Problem is when you take them out early the rumen hasn't healed to the side of the animal, the hide crusts over and then the gas and junk escapes inside the body, poisoning the animal. Animal looks bloated again, but its very difficult to reinsert the trocar since the rumen isn't tight against the side this time, after you realize you took it out too soon. And yes its a good thing to have on hand for the odd times you need one. Why is it ever a bad thing to have a tool ready when you need it? And this isn't about a cow that just looks overly full, its for when an animal is laid out /dying of bloat. Supa Dexta wrote: Once you put one in leave it for 3 or 4 weeks. Problem is when you take them out early the rumen hasn't healed to the side of the animal, the hide crusts over and then the gas and junk escapes inside the body, poisoning the animal. Animal looks bloated again, but its very difficult to reinsert the trocar since the rumen isn't tight against the side this time, after you realize you took it out too soon. Where do you screw the trocar in at? I assume up towards the top half and around the 5th or 6th rib? Here's a pic I found online, I tend to keep it forward within that triangle, left side of the cow of course. First take a razor blade/scalpel and cut thru the hide slightly (not all the way thru) and 3/4" long or so - just so you can break thru the hide easier, then take the trocar and stab it like you're performing a prison shanking. Don't hesitate, you want a good solid stab, and then push in tightly as you screw it in and snug it in tight against the hide. Stand aside and pull the plug as the pressure shoots out. 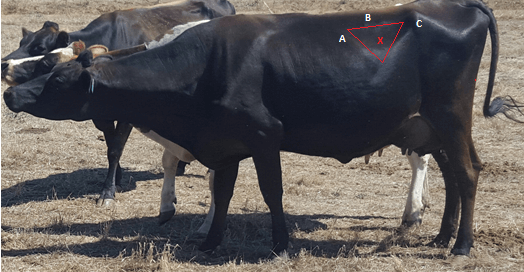 Supa Dexta wrote: Here's a pic I found online, I tend to keep it forward within that triangle, left side of the cow of course. Here's how mine looks today. I'm wondering if the trocar isn't plugged, she appears a little puffy in this pic, but she was laying down with the others when I got there. She appeared normal this morning. Take the plug and poke it back in the hole if you think its plugged. Will usually be bubbling, gassing off, whistling sometimes even.